CANON imageRUNNER Pro 7138VP | Welcome to JJ Bender! The Canon imageRUNNER Pro 7138VP is a robust, new machine capable of producing cost-effective results for high volume printing applications. It is a perfect solution, suitable for use in medium-to-large, in-house, commercial, transaction printer, and data center environments to meet document management needs in a short time. The Canon imageRUNNER Pro 7138VP digital press offers crisp 600×600 dpi resolution printing at speeds of up to 138 pages-per-minute in black and white. In addition to offering high-productivity, exceptional image quality, and excellent performance; it comes with a broad range of robust paper handling capabilities, powerful front-end software, media choices, professional finishing options, and Magnetic Ink Character Recognition (MICR) capability. With the imageRUNNER 7138, you can achieve increased volume of variable data printing applications. You can also modify the finishing configurations as per your choice based upon your volume and application requirements. The device has three paper supply drawers with a total holding capacity of 4,000-sheets. A standard finisher, providing a 3,000-sheet capacity and 100-page-per-set stitch capacity is also included. Besides all this, it includes a full array of features such as a short-straight paper path, race-track design, and a vacuum-corrugated feeding system. Moreover, it possesses a Sun Ultra 45 Controller which provides all the modular and expandable features to maintain productivity across a range of multifaceted jobs. Max Page Size: 14 x 18.5"
Are you in need of a Canon imageRUNNER Pro 7138 VP lease from an established firm? Contact JJ Bender today. JJ Bender offers a tailor-made, affordable lease on the Canon 7138 that will help in the expansion of your business. If your business has reached a point where a Canon imageRUNNER Pro 7138 VP lease is essential, you must analyze all your options as you would be committing plenty of resources to the machine. JJ Bender will give you an idea of what can be expected when you first install the machine. 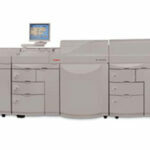 We also provide you with the conditions and expected lease payments for your Canon imageRUNNER Pro 7138 VP lease.